At Park Veterinary Hospital, we love providing senior dogs with the care and support they need to age gracefully and comfortably. We understand that the experience of caring for older dogs can be a tremendously rewarding one that enhances and enriches the lives of dogs themselves, as well as their human caretakers. We truly are dog people at heart. We love to lend insight and guidance into caring for older dogs. This is why it is important to consult our veterinarian about the best senior dog food option for your canine companion. Specially formulated senior dog food is easier to digest, might also address liver, kidney or urinary issues, as well as the general nutritional needs specific to senior dogs. Of course, the physical condition of your senior dog will ultimately determine exercise duration and frequency, and we recommend consulting our veterinarian about the most appropriate and effective exercise routine for your canine companion. 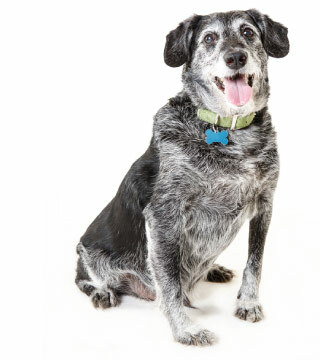 In general, senior dogs tolerate vaccinations the same as younger dogs. Nonetheless, we evaluate each dog individually when deciding upon a vaccine protocol. Because vaccination schedules are unique to every dog, we recommend discussing vaccinations with our veterinarian to choose the options that are right for your elderly canine companion. Senior pets are as vulnerable to parasites as younger dogs and in some cases even more so. Unfortunately, they may not be able to groom and care for themselves as well as they once could and therefore may not show clear signs of distress when infected by fleas and ticks. Therefore, it is very important to maintain consistency with flea/tick and intestinal parasite control programs for aging dogs. Our veterinarian can help determine if any changes should be made to an existing senior dog care parasite control program, as well as if a program should be implemented or terminated altogether.